April Showers and Flowers Bloom at Holden House! APRIL SHOWERS AND FLOWERS SPRING PACKAGE 2017 – Your special Spring break getaway for 2 or more nights Sunday through Thursday includes a complimentary breakfast ensuite Romance Package and a special bouquet of long-stemmed fresh roses to celebrate Springtime in the Rockies! *Full amount of stay required when booking, nonrefundable and cannot be applied to existing reservations. To celebrate the blossoming of Spring, Holden House 1902 Bed & Breakfast Inn, located in Colorado Springs, is offering an “April Showers and Flowers Spring Package” all month long. Guests who stay 2 nights or more Sunday through Thursday in any of the inn’s six beautiful antique-filled guest suites can take advantage of this great package offer which treats guests to a specially prepared complimentary breakfast served ensuite one morning of their stay (gourmet breakfast served in the dining room is always included) and a bouquet of long-stemmed fresh roses on arrival ($90 total value). A delicious full gourmet breakfast is also included each additional morning of your stay, served in the elegant formal dining room. The inn’s romantic suites boast fireplaces, private sitting areas, and soaking tubs. Help us welcome Springtime in the Rockies with added amenities to keep love and romance blooming all through April! 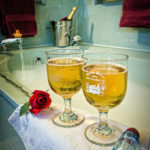 This entry was posted in accommodations, anniversary, bed and breakfast, bed and breakfast inn, blog, breakfast in bed, bubble bath, package, romantic, roses, specials, spring forward, sweetheart and tagged accommodations, anniversary, bed and breakfast, bed and breakfast inn, blog, breakfast in bed, bubble bath, holden house 1902 bed & breakfast inn, package, romantic, roses, specials, spring forward, sweetheart by admin. Bookmark the permalink.